Industry analysis firm Canalys released its newest figures on Monday, showing that Apple and Samsung combined account for about 45 percent of all smartphones shipped worldwide in the second quarter of this year. Out of the 238.1 million units shipped last quarter, Samsung shipped 75.6 million, while Apple shipped 31.2 million. Apple's year-over-year shipment growth for the quarter was 20 percent, according to Canalys, while Samsung saw 55 percent growth. Still, those growth numbers pale in comparison to those of the next three largest manufacturers. Lenovo more than doubled its smartphone shipments year-over-year, going from 4.9 million in Q2 2012 to 11.3 million and third-place among manufacturers this year. Among the top five, Lenovo's 131 percent YoY growth was topped only by Yulong, another Chinese vendor that saw its shipments jump 216 percent from 2012, moving from 3.4 million to 10.8 million. South Korea's LG also saw considerable growth in shipments. 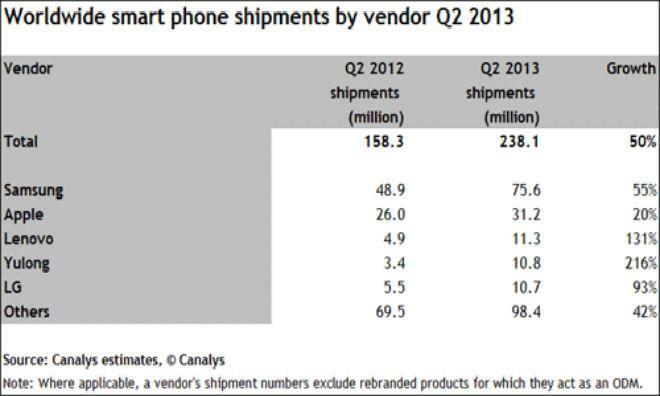 LG moved 5.5 million units in Q2 2012, and 10.7 million in the same quarter for 2013, an increase of 93 percent. The latest figures illustrate the challenge for Apple going forward. The highest growth in smartphone shipments is occurring in emerging markets, where consumers are less likely to be able to afford Apple's typically premium-priced devices. China has already surpassed the United States for the world's largest smartphone market, and that nation's 88.1 million shipped units for the past quarter represent 108 percent growth from the same quarter a year ago. India, meanwhile, moved past Japan and the United Kingdom last quarter, growing 129 percent year over year to ship 9.0 million units. 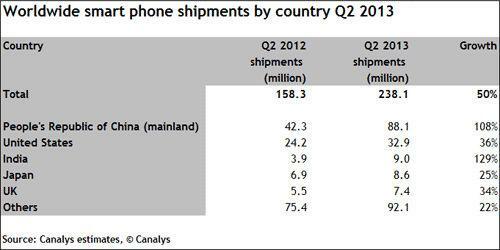 Similarly, markets like Brazil and Russia are increasingly important in the smartphone industry. In addressing these markets, Apple is faced with competition not only from Samsung  which takes a scattershot approach, releasing dozens of models in a year across multiple pricing tiers  but also an array of Chinese vendors. Those vendors  including Lenovo, Yulong, Huawei, ZTE, and Xiaomi  made up 20 percent of worldwide shipments this past quarter, up from less than 15 percent for the same quarter last year. Apple is widely believed to be preparing a lower-cost iPhone in order to address these markets. The low-cost device is said to sport a plastic chassis and perhaps a less powerful chipset, allowing Apple to save on production costs and offer the device at a price more palatable in developing markets. Canalys' report also found that Google's Android platform now powers 80 percent of phones shipped worldwide. Apple's iOS holds 13 percent of the market.